Moroccan-style lamps ... from the Small Space collection. Award-winning South African lighting design company willowlamp has launched an accessible ‘Small Space’ collection, which is described as a perfect lighting solution for compact urban spaces. 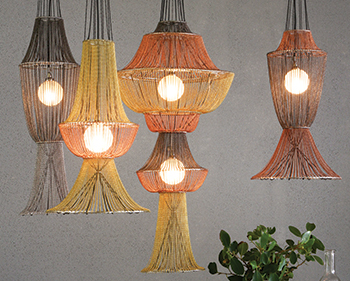 “We have enjoyed great success with our original designs and are still producing our traditional larger installations but we also wanted to expand and create smaller lights that elevate more compact spaces,” says Adam Hoets, creative director at willowlamp. The willowlamp success story began with a single simple idea: The willowlamp notch system that allows curtains of ball chain to flow elegantly from laser-cut steel frames. Today, the cutting-edge designs bring life and light to large and small spaces all over the world from residences to hotels. The original lighting designs are shaped by the principles of geometry and built with world-class lighting technology, craftsmanship and superior materials to create timeless yet functional works of art. The collection is available to order with a lead time of four to six weeks. Parquet, the latest kilim collection produced by GAN, was among the cutting-edge designs showcased by the indoor brand of Spain’s Gandiablasco at the IMM Cologne interiors fair, held in Germany last month. 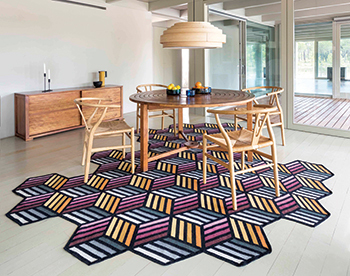 The colourful Parquet collection has been designed by the avant-garde creatives Anna Lindgren and Sofia Lagerkvist from the Swedish studio Front inspired by the shapes of classic flooring. Parquet is a creation of rare geometric lucidity. Based on traditional flooring patterns, Parquet follows the logic of its geometry to its very limits and displays a level of craftsmanship only achieved through generations of experience, says a spokesman for GAN. GAN has over the years collaborated with designers who recognise the potential of geometry as a central element in the composition, not only of its products, but in entire spaces. Its collections include RAW, created by Borja Garcia, which combines wool and jute in a geometric matrix adapted for rugs, poufs and cushions; and Rustic Chic collection, designed by Sandra Figuerola, with its playful compositions relieved by figurative elements. Then there are the kilims, the ancient versatile rugs that originated with Nomadic cultures; Hexa, created by Enblanc, hexagonal in shape and subdivided into colourful lines and shapes; or Mosaiek, an exercise in elemental geometric pattern designed by Javier Tortosa. Pulsa ... “a true design object”. 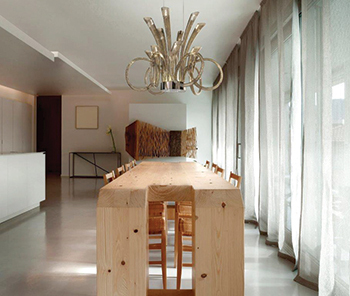 The Pulsa suspension light, designed by Danilo De Rossi for Italamp, offers an artistic representation of the magnetic field of a Pulsar star, which gives the product its name. Rotational energy is expressed through vortexes of blown glass, illuminated by LED light sources. Like a star, Pulsa emits light directly towards the ground, but also indirectly towards the ceiling, according to a spokesman for the Italian leader in the interior lighting sector. “The light source is not directly visible, creating uniform, diffused lighting. The fluid, spiral movement, with sinuous, orderly lines, elevates Pulsa from a mere furniture complement to a true design object,” the spokesman says. Pulsa expresses a classic style reinvented through timeless products that are never commonplace – aside from the small LED bars deliberately placed on the inside of the dove-grey or white glass arms, almost as a reminder of the light’s more ‘traditional’ role and attesting to how Italamp can perfectly combine tradition and innovation.